You will be delighted with this gorgeous SOUTH of 30-A home located at 89 Hopetown Lane in Rosemary Beach. The front of the house faces a charming pedestrian boardwalk that leads directly to the beach. Out the front door and it is just a one minute stroll to the water. Behind Amsler Cottage is downtown Rosemary and The Pearl, Rosemary's new inn. There is easy access to the shops, the restaurants, and the hustle and bustel of town activity. If you want to be near the town center, the Western Green and the Gulf, this is an ideal location. If you want to be in the quietest and more remote corners of Rosemary, this is not the house for you. Professionally decorated, the furnishings strike a perfect balance between comfort and elegance. Unique lighting fixtures, luxurious fabrics and elegant furnishings abound with hardwood floors, mahogany French doors and custom finishes throughout. There are 3 fully furnished porches and a courtyard to enjoy as well. The first floor is an open area anchored by three sets of mahogany French doors. Watch as beach goers stroll down the boardwalk while dining, watching your 40' flat screen LED/LCD TV or reading in front of the gas fireplace. There are 5 flat screen TVs in the house. Movies and tv shows can be streamed at no charge through Netflix. (We also provide HBO and Starz as a courtesy to our guests.) Custom made slipcovers and sea grass rugs create an upscale yet comfortable atmosphere. The fully equipped gourmet kitchen features granite and tumbled marble finishes, Bosch dishwasher, gas burners, a separate beverage fridge and custom made cabinetry. Seating for 8 at the square dining table as well as counter top seating provides room for 10. 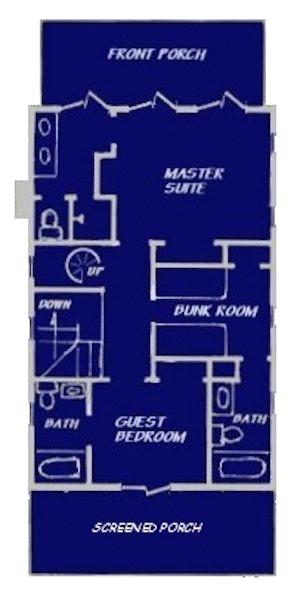 Also on the first floor is a guestroom with a queen bed for those that prefer not to climb stairs. Crisp linens dress the bed and there is a beautiful full en suite bath for this bedroom. Travertine tiles, a trough sink and a rain head shower make this bathroom a true spa experience. 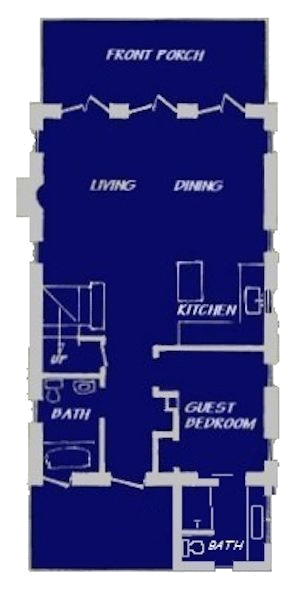 The second floor has 3 true bedrooms, all with private en suite baths. All beds are supplied with high quality mattresses and linens. The master holds a romantic hand carved queen size four poster canopy bed with silk roped curtains. French doors lead out onto a porch with Gulf views and comfortable furniture. The master bath has double custom made sinks, travertine floors and a large shower. The bunk room has four individual custom built extra long twin beds and an en suite bath with tub and shower. Each bunk has its own light and curtains that can be drawn for privacy. It is ideally suited for kids but we have had many happy adults sleep there as well. The fourth guest room has a beautiful antique white queen bed and mahogany french doors that lead to a large screened-in porch. The porch is equipped with a custom made hanging swing bed and another area to just read and relax. This room also has an en suite bath with tub and shower. Up a spiral staircase to the third floor is an extra space for those occasional rainy days. Featuring a built in daybed, a flat screen TV and a DVD/VCR, it is a great open space for kids to play or a private retreat for an afternoon nap. Books, games and children's movies are provided for your enjoyment. The back courtyard is walled and has a big built in natural gas grill, comfortable seating for 10 at a custom made table and a lovely fountain. There is no carriage house on property which is a huge plus. Note: Many of Rosemary Beach homes have a garage/carriage house that is built behind or adjacent to the main one. Unless you rent both structures, parking availability, the size of the outdoor space as well as privacy may be affected. No sharing with strangers here as the outdoor space at this home is yours alone to grill, dine and enjoy. Although Amsler Cottage is ultimately about forgetting the outside world, we do provide wired and wireless internet access should you need to stay in touch. A 50% deposit is due at time of booking. Remaining balance is due 60 days prior to arrival. A full refund less $300 is guaranteed if reservations is cancelled outside of 60 days.